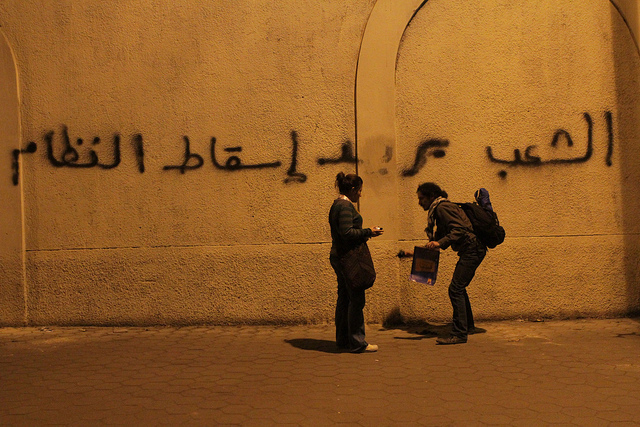 "The People want the regime to fall." In the US, our reality shows judge contestants on the skills that we apparently expect our celebrities to have: a rather inhuman body, ruthless guile, some dance moves, and a decent singing voice. When Egypt picks its “Idol,” though, the criterion is poetry. The slogans the protesters are chanting are couplets—and they are as loud as they are sharp. The diwan of this revolt began to be written as soon as Ben Ali fled Tunis, in pithy lines like “Yâ Mubârak! Yâ Mubârak! Is-Sa‘ûdiyya fi-ntizârak!,” (“Mubarak, O Mabarak, Saudi Arabia awaits!”). In the streets themselves, there are scores of other verses, ranging from the caustic “Shurtat Masr, yâ shurtat Masr, intû ba’aytû kilâb al-’asr” (“Egypt’s Police, Egypt’s Police, You’ve become nothing but Palace dogs”), to the defiant “Idrab idrab yâ Habîb, mahma tadrab mish hansîb!” (Hit us, beat us, O Habib [al-Adly, now-former Minister of the Interior], hit all you want—we’re not going to leave!). This last couplet is particularly clever, since it plays on the old Egyptian colloquial saying, “Darb al-habib zayy akl al-zabib” (The beloved’s fist is as sweet as raisins). This poetry is not an ornament to the uprising—it is its soundtrack and also composes a significant part of the action itself. He goes on to chronicle the roles poets have had in past popular movements in Egypt. And, with a close reading of a phrase that’s popular right now, Colla shows just how important having the right verse can be to rallying people around a cause. the act of singing invective that satirizes feared public figures has an immediate impact that cannot be cannot be explained in terms of language, for learning to laugh at one’s oppressor is a key part of unlearning fear. Those who decide to make their own history are, in the end, not only required to write their own script and build their own stage, they are also compelled to then play the new roles with enough force and conviction to make it cohere, even in the face of overwhelming violence. […] American know nothings hopefully will soon become the human trash they deserve to be in the World. I have had enough of their arrogance and ignorance of other cultures in this lifetime. 3 comments before mine. What utter racism among CD “liberals”! !